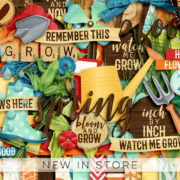 It’s Friday and that means new scrapbooking goodies in store! 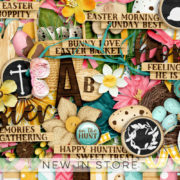 The new kit Natural Beauty with its gorgeous color palette is just perfect to scrap about the beautiful people, animals and places in your life! This month I am the featured sponsor at My Scrapbook Art and I made a coordinating freebie especially for their FB fans. You can find it here! This week I teamed up with the amazing Mommyish and together we are bringing you this fun and bright kit! Seek Happiness was designed to help you celebrate those happy moments in your life! It’s packed with fun stuff and 12 journal cards are included as well! And it’s 30% off through the weekend! This is also the last weekend that you can pick up all Dollar Days products for 50% off! Don’t miss out! 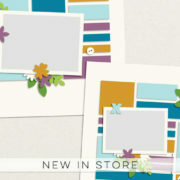 And don’t forget to pick up my part of the DigiScrap Parade! It’s time for featured favorites at P&Co! These coordinating products are 50% off through Thursday! And in case you missed the Dollar Days sale last month, you can grab them all now for 50% off as well! Offer ends Sunday! It’s August and that means it is time for another DigiScrap Parade! Yay! There are so many awesome goodies and after completing the parade you’ll end up with a HUGE collab! This is my contribution! You can pick it up on the DSI Facebook page and there is also a coupon included in the download! And today the August Company Stash is also hitting the store! I have two beautiful packs for you! Down By The Sea Elements and Down By The Sea Papers are perfect for documenting your precious beach memories! And the team did an amazing job as always! The month is almost over and that means there are only a few days left to stock up on some amazing goodies during the Dollar Days sale! Here’s a little roundup of the DSI Dollar Days products! And don’t forget to pick up this freebie if you haven’t already! I hope you are enjoying all the crazy deals this month and thank you so much for your support! Dollar Days at P&Co is still in full swing and that means more amazing deals for you! First up are the Travel Adventures Templates! 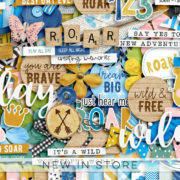 This fun and bright set coordinates with All Year Round – August Papers and Elements which are also part of the Dollar Days sale! And the last DSI Dollar Days product has just been released! Summer Nights is a perfect kit to scrap all those precious memories of campfires, singing songs and late nights during summertime! And you can get all 15 papers and 45 elements for just $1! There are only a few more days left to stock up on some amazing Dollar Days goodies, so be sure to check them out! I have some awesome new goodies for you! 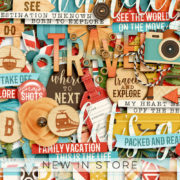 All Year Round August Papers and All Year Round August Elements are available early and they are perfect for scrapping all your summer and travel adventures! And each pack is just $1! The last part of Back To Basics is now also available in store! With Back To Basics Wordart you get 142 wordstrips that are great for documenting your everyday life and special occasions! Also available for just $1! The Dollar Days sale at Pixels and Company is still going strong! And I have a few new goodies available for you! Back To Basics Papers and Back To Basics Elements are the perfect addition to your stash! The soft and neutral colors make these great go-to products and they work really well on their own as well! And with 32 papers and 64 elements for just $1 each, these packs really are a must-have! And there is much more still to come! So be sure to check back regularly! Are you ready for a great month?! It’s time for Dollar Days at Pixels and Company and that means a whole lot of fun! Every day new products will be released and they are just $1 for the whole month of July! So time to get your shopping on and stock up on some amazing goodies! First up from me are Fresh From The Oven Papers and Fresh From The Oven Elements! Remember they are just $1 each! And I’ve got a little freebie for you as well! Hope you enjoy it! Last but not least, I am very excited to announce that from now on I am no longer a guest at P&Co and can now call it my permanent home! All Year Round July is hitting the stores today! It’s perfect for all those fun 4th of July festivities and great for scrapping other celebrations as well! And as always there is a coordinating template pack available as well! Both the kit and the templates are 30% off through Sunday!